Last week, we got to tour a whole lot of sewing spaces through the Studio Spotlight series at Ellison Lane. I just love that. So much fun to see where others sew, to drool over those who are blessed with a huge designated crafting space, to be inspired by those who make a small space work. You could link up your own space. I didn’t. I’m about to show you why (insert suspenseful music here: dum-dum-DUUUUM). Our new house has a little sitting room just off the master bedroom. It could be used as a nursery or an office, but my husband gave me free reign to use this as a sewing room. Don’t think he’s too benevolent, he just didn’t want my fabric vomit in the main area of the house! It’s a little room, about 9 x 10 feet, but when it’s functional, that’s 90 square feet that all mine! Right now, though, it’s definitely NOT functional. This is the back of the room, looking in from the master bedroom. Look! There’s a closet with just one shelf. Isn’t that useful. And a pile of envelopes for the “Secret Project” I’m working on. I’m still waiting for a few more of those envelopes, and I need to get this space in shape so I can bust out that project. The other corner in the back of the room is below. The stack of white baskets is where my fabric is usually located, but it’s currently hiding inside cardboard boxes. I’m looking forward to being reunited. Okay, now we’re standing with our backs against the back wall, looking out into the master bedroom. Somebody left a sleeping baby on my bed. There’s my cutting table, on its side. That’s useful. And the final corner of the room. I took the door off because they opened into the room against the wall, and with this little room, I figured I could use all the wall space I had. That ironing board really needs a new cover. There’s a stack of mdf shelves, which will go into the one shelf closet you saw in the first photo. So there you have it. There’s a lot of work to do in here. How’s your space looking? Come on, be honest. Go right now and take some photos. 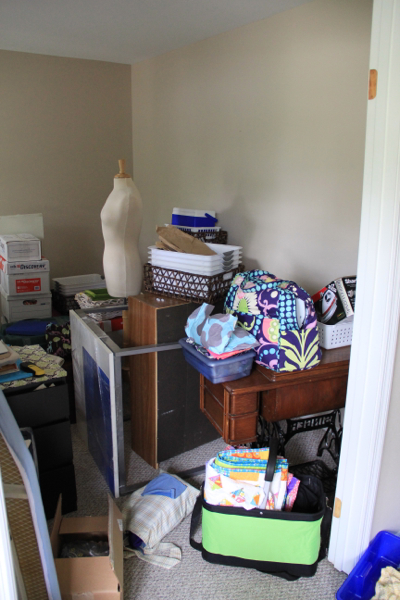 I want to see those stacks of fabric that you pulled and never used, your cutting table that is more WiP storage than cutting area, the pens and pins scattered across your sewing table, and the things on the floor that really shouldn’t be on the floor! Seriously, this is The Before. We are going to get our spaces in order together and then we can brag about great they are after. Not to mention, it’s so refreshing to be creative in a space that’s been cleaned up. We’ll check in next week and in two weeks, we’ll post our “after” photos. It will be our own little sewing studio tour for those of us whose spaces weren’t in any shape to show off this week! If you’re on Instagram, post progress pics with hashtag #sewingroomcleanup. The “be honest” made me crack up. I am fortunate to sew in our second living space. I have two large tables pushed together. One holds my machine with space on each side and one is where the current project with a large cutting mat sit. All of my fabric is on built-in shelves. The rulers are under the second table. Everything is all nice and neat because I just cleaned it all up on Sunday. Seriously. 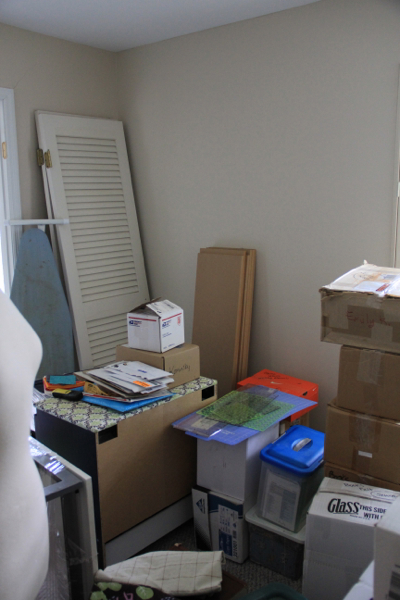 No one would believe a quilter lives here because it looks way too organized. Honestly, I don’t function well in chaos and it’s never in terrible condition. Rarely are there more than two projects humming along at one time. But I love the creativity shown in everyone’s space. Thanks for participating. Oh, I am so with you. Moved in just about two weeks ago. Everything is still slightly a disaster. I can’t remember how I made this all work last time! I’m anxious to see what you can accomplish in two weeks. You go girl! I’m trying to pluck up enough courage to show you the mess I’m working in at the moment! At least you have a very good excuse: you’ve just moved! My “official” excuse is I don’t have much time for tidying up but of course it’s just an excuse! Oh my gosh that is a great idea! You will have a beautiful space once you get it finished. I so can’t wait to see it. Okay, you have totally inspired me!!!!! I am going to take pictures of my space and update as I work on it, but remember you asked to see it!!!!! 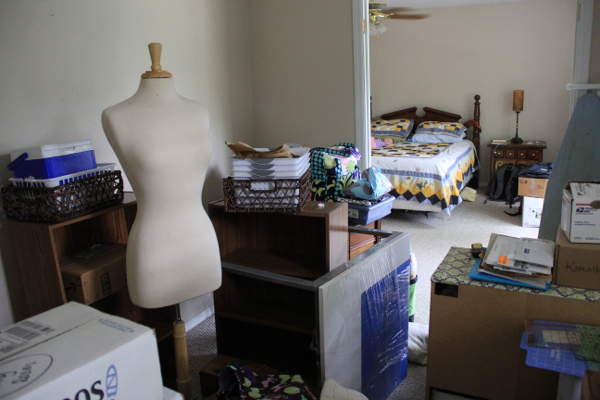 I’m dying to see your finished sewing room. Great space to work with. My room is a spare bedroom that’s downstairs off the sitting room so I can still speak to hubby if I need to. LOLLL I’m in here most of the day either sewing, playing on the internet or just sitting and looking around to see what I can change and improve. I have a large cutting table in the center the size of a single bed but I need some new legs for it so that’s the next project in here. What good timing! 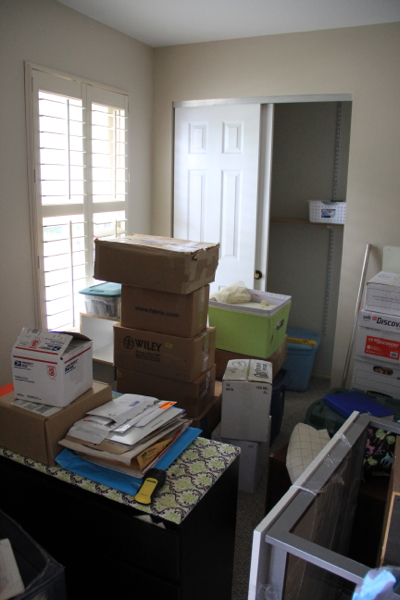 I was just thinking about what part of the unpacking to embark upon this afternoon. My space is/will be a sewing/microscope work area, what can I saw tiny house, lots if interests. I am so happy to see these two things again, they have been in storage for almost three years now! Now to see what are in all these boxes. P.S. Sorry for the double image, am not sure what went wrong or how to fix it. I don’t have a website, so I can’t link up, but it’s my last week of summer and I have had to halt all work on my set of twin quilts b/c my office/craft room is such a disaster. I had really hoped to get myself organized over the summer, but 2 surgeries and a sprained knee + a 3.5 year old don’t lend to much “free” time to tackle such projects. I AM going to make a concerted effort to work on it along with you this week though. (I did take before pics and will take an after pic. Maybe I can email them to you so you know you’re not out there alone.) 😀 Happy Organizing! !